쇠북이란 절에서 대중을 불러모으거나 의식을 행할때 사용하는 청동으로 만든 소리내는 도구이다. 금고, 금구, 또는 반자라고도 불린다. 이 금고는 조선 후기에 많이 쓰였던 재질인 청동으로 되어 있고, 크기는 직경 77.2㎝, 두께 12.7㎝로 큰 편이다. 표면의 공간은 큰 동심원을 그린 다음, 금고를 두드리는 자리인 당좌의 원과 안쪽 원, 바깥쪽 원으로 나누었다. 당좌는 3중의 연꽃무늬를 돋을 새김하였고, 안쪽 원에는 봉황무늬 3개와 구름무늬 3개를 배치하였다. 바깥쪽 원에는 연꽃무늬 5개와 이중의 연꽃무늬 5개를 교대로 배치하여 장식하였다. 측면에는 금고를 매달 수 있도록 위쪽과 옆구리에 3개의 고리를 달았으며, 뒷면에 만든 시기를 적은 글이 있다. 문양의 표현은 고려시대 금고에 비해 앞면의 문양이 더 도드라지고 자연스럽다. 금고 뒷면에 새긴 명문을 통해 1646년에 만들어졌음을 알 수 있고, 무늬의 각종 표현이 고려시대와 조선시대 금고의 문양을 연결해주는 점에서 중요한 의미를 지닌다. 아울러 금고를 거는 금고리 역시 금고와 거의 같은 시기에 만들어 진 것으로 파악되어 귀중한 자료가 된다. This bronze gong is struck to bring the community together or announce an emergency situation. Bronze gongs of this type were used at many Buddhist temples in the late Joseon Dynasty. This is a relatively big gong, 77.2 centimeters in diameter and 12.7 centimeters thick, with the front surface divided into three concentric circles. The innermost circle surrounds the striking point carved with a relief triple-layer lotus design; the middle circle is decorated with three phoenixes and three cloud patterns alternately arranged; and the outer circle has ten lotus flowers, five of them with single petals and the other five with double petals. The gong has three hooks on the side, one at top and two on the sides, to be hung. 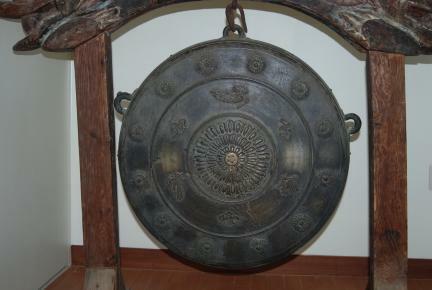 The rear surface has an inscription revealing that the gong was made in 1646. The thick decorative patterns have a painterly quality typical of late Joseon style. The arrangement of patterns provides useful clues for the study of stylistic changes in temple gongs.